The family Rocco is from Naples and claims descent from Cesare Rocco who married Ippolita Carafa. 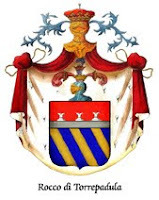 Their son Carlo Rocco was created Principe di Torrepadula in 1641. His daughter and heiress Donna Ippolita Rocco, Principessa di Torrepadula, married to Andrea Petagna, exchanged Torrepadula for Trebisacce in 1655 (inherited by Correr from Venice and fief sold in 1797 to Giacomo Pucci). The present family traces its descent from a brother of Carlo. Created Nob. on 11-6-1925. Giovanni Rocco di Torrepadula (1874-1940), was created a Principe on 13-1-1936. His brother Giuseppe Rocco di Torrepadula (1883-1967) was recognised as Principe on 20-5-1954. 120. Mathieu Frachon * Annonay 15-7-1811 + Annonay 9-9-1891; Pr´sident du Tribunal de Commerce; Zn van Xavier F. en Claudine Lucie Malgontier = 108. 121. Eugénie Soulier * Vienne 1826; Dr van Jean François Marcelin S. en Geneviève Adélaïde Clemaron = 109. 126. Laurent Pierre de Montgolfier * Saint-Marcel-les-Annonay 6-9-1816 + Vidalon 18-12-1883; Zn van Elie Louis de M. en Pauline Claudine Duret = 106. 127. Hélène Seguin * 4-6-1821 + Vidalon 29-5-1866; Dr van Marc S. en Rose Augistine Duret = 107.